School days are just around the corner and summer vacation is almost at its end. Some kids would want their vacation extended, at least for a few more days, but there are also those already very excited to go back to school to see their friends, probably meet new ones, and to learn new things, and of course, to show off and use their new possessions. So parents, get ready to gear them up with cool but very useful stuff. But before you hit the shops, makes sure to have a checklist of your child’s school needs this will save you a lot of time and money. You may also show this to your child, so he/she will have an idea of things to buy and lessen the possibility of tantrums over things he/she won’t use. Of course, buying back-to- school supplies at a bargain price would be a big help. And shopping at Tutuban Center would be the best go-to place not just for great deals but also for comfortable shopping experience. At Tutuban Center you’ll find all the learning tools your children will need in the school—of good quality yet at affordable prices. Don’t settle for old and used school uniform if you can buy them brand new but at a lower price at Tutuban Center. It has tailoring and dress shops where various readymade school uniforms are available. There are also shops where you can buy calculators, electronic gadgets, computer and computer accessories. Prescribed text books and even hard to find books are also available in bookstores at Tutuban Center. These bookstores also carry a variety of dictionaries, thesaurus, and various study aids for shopper’s convenience. After all the shopping and other preparations, your kid will be ready for school in no time. They will be all geared up for another year of fun and learning. 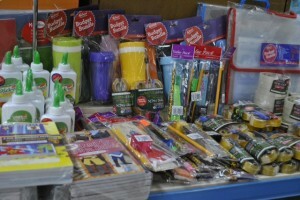 All you have to do is just visit one place to get all the stuff your kids need, all of it at Tutuban Center. Superbook's Pilot Episode Garners High Ratings!